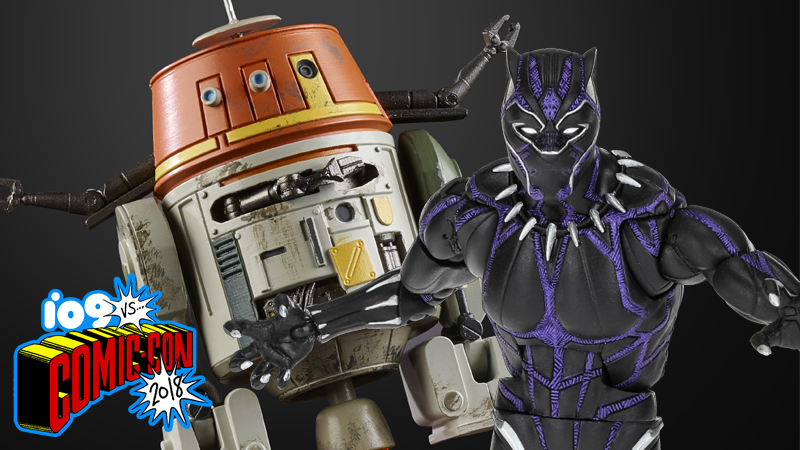 Hasbro took to Comic-Con this week to lift the lead on some of its latest toys from both the world of Marvel and a galaxy far, far away—and if you loved Star Wars Rebels and Black Panther, boy is your wallet in for a pummeling. First up from the Marvel side of Hasbro’s 6-inch action figures, which is launching a second wave of toys based on Black Panther. Unlike the first wave of figures, this second batch only features characters from the film: Ayo of the Dora Milaje, King T’Chaka in his own regal version of the Black Panther suit, Erik Killmonger in his kinda-sorta-Vegeta-looking mercenary gear, Ulysses Klaue, and two versions of T’Challa, including an unmasked version (featuring a new likeness of Chadwick Boseman) in his Civil War Black Panther suit, and a masked version in his glowing Vibranium-enhanced suit. Marvel Legends Black Panther (Vibranium-Enhanced Suit). If that wasn’t great enough, not included in the press materials but teased at Hasbro’s preview breakfast event at the convention was that these figures will be joined by everyone’s favorite tech genius, Shuri. Collecting all the figures in the wave will give you the parts to make a new separate figure, as with other Marvel Legends waves. Except, instead of being a giant monster or oversized creature figure, this time it’s...M’Baku. Beefiness so profound that he needs an extra-sized action figure! I love it. Meanwhile in the galaxy far, far away, Hasbro announced a bunch of new additions to its Black Series range of 6-inch Star Wars toys. From Solo: A Star Wars Story, the multi-armed alien Rio Durant (voiced by Jon Favreau in the film) will be joining the line, as will two more additions from Star Wars Rebels: Ezra Bridger (with his longer-haired look from the show’s earlier seasons) and Chopper, who amazingly comes with an articulated stand to depict the little droid jet-boosting into the air. The Black Series Rio Durant. The Black Series Ezra Bridger. Look’s like Team Chopper is blasting off agaiiiiiiiiiin! On top of that, Hasbro also announced a new sub-line for the Black Series: Black Series Archives, which will re-release core figures from the earliest entries in the line (it’s been around since way back when in 2013, after all) so fans can get the chance to collect iconic characters they’d missed out on, like Boba Fett or Luke in his X-Wing pilot gear. On top of that, humanoid figures re-released in the Archives branding will receive updates in the form of Hasbro’s “photo-real” painting process, introduced to the Black Series line earlier this year to give more accurate paint jobs and likenesses to the figures. The Black Series Archive re-release of Luke Skywalker (X-Wing Pilot). The Black Series Archive re-release of IG-88. The Black Series Archive re-release of Bossk. Rounding out the major announcements for Star Wars were also multiple new figures in the recently rebooted 3.75-inch line, the Vintage Collection, which will be receiving new figures from A New Hope (in the form of a Death Star Gunner), The Last Jedi (a Praetorian Guard), Rogue One (both a Scarif Shoretrooper and a normal, updated Stormtrooper) Solo (Lando Calrissian), and, surprisingly the old Expanded Universe (Knights of the Old Republic’s Darth Revan). The Vintage Collection Death Star Gunner. The Vintage Collection Praetorian Guard. The Vintage Collection Lando Calrissian. The Vintage Collection Darth Revan. It’s going to be an expensive year.